Camelot. Young Frankenstein. It’s a Wonderful Life. Dirty Rotten Scoundrels. Philadelphia Story. 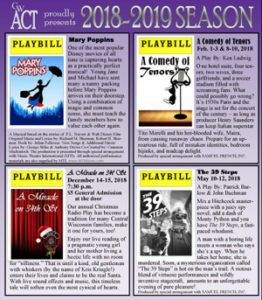 If you didn’t see these or other Central Wisconsin Area Community Theater (cwACT) performances, you missed exceptional theater! Community theater is a gift for the community. In addition to providing wonderful entertainment, community theater offers many opportunities for onstage and backstage participation. These opportunities are not just for the experienced participants. Community theater welcomes and encourages anyone who has an interest and desire for fun. Because of community support, cwACT has increased the number of productions per year to include summer children’s theater, summer dinner theater, Christmas radio plays and monthly improv shows. Combined with our 40+ years of performing musicals, dramas and comedies, we offer an incredible selection of year round entertainment and opportunities for everyone. Corporate sponsorships help us continue realizing our vision of exceptional theater in central Wisconsin, and providing involvement opportunities for people of all ages. You can help us continue our gift to Central Wisconsin by sponsoring one or more of our performances. As our thank you, each sponsorship includes your business logo on the performance poster, 4 tickets to the performance and special mention during director’s pre-show comments. Please consider one or more of the levels of support below. To sponsor a performance or for more information, please contact us at sponsor@cwact.org.